be harmful to brain development. • Fetal MRI (magnetic resonance imaging): This type of imaging gives more detailed pictures of your baby’s organs, particularly the brain. Some congenital conditions are caused by changes in DNA, or a baby’s genetic make-up. The doctors may suggest genetic testing to find out more about your baby’s DNA. • Cell-Free Fetal DNA testing: Your doctor can take a sample of your blood to look for copies of fetal (baby) DNA. This is only a screening test. A positive result means that there could be problems with the DNA. This should be confirmed with another test to be sure of the result. This additional testing can be done before or after birth depending on your needs and the needs of the baby. • Testing the baby: After birth, a test is done with a sample of your baby’s blood to look for chromosome problems. This is called either a “karyotype” (basic chromosome study), or microarray (a more detailed look at smaller pieces of DNA. If a test finds you are carrying a baby with hydrocephalus, you will continue to receive care from your obstetrician. Your obstetrician may refer you to the Ohio Fetal Medicine Collaborative (OFMC), which will help you connect with a team of fetal medicine experts. prepare you for what to expect. Your baby may need to be monitored for these symptoms after birth. At the delivery hospital, a neonatologist (a doctor who specializes in treating newborns) will manage the care of your baby. The neonatologist will assess your baby’s breathing, heart rate, measure the head size, and examine the baby for other problems. Your baby’s head may appear larger than normal. Your baby may have several tests to confirm hydrocephalus and look for the cause. Additional pictures of your baby’s brain will be taken by ultrasound and/or magnetic resonance imaging (MRI), to determine how severe the hydrocephalus is, and whether there are any additional problems with the brain. Additional genetic testing may be needed as well. • Your baby may be able to breastfeed or feed from a bottle and then go home with you. It is very important for your baby to follow up with the neurosurgeon in the office for a complete evaluation. • Your baby may receive care in your delivery hospital’s neonatal intensive care unit (NICU). • An intravenous line (IV) may be started in your baby’s arm, hand, foot or scalp. The IV provides fluids, medicines, nutrients and antibiotics to prevent dehydration and infection. If treatment is needed, the goal is to reduce the pressure in the baby’s head and to drain the cerebral spinal fluid (CSF). Surgery may be needed to treat hydrocephalus. There are two main types of surgical procedures for managing hydrocephalus. Your neurosurgeon will discuss these with you and decide which is best for your baby. 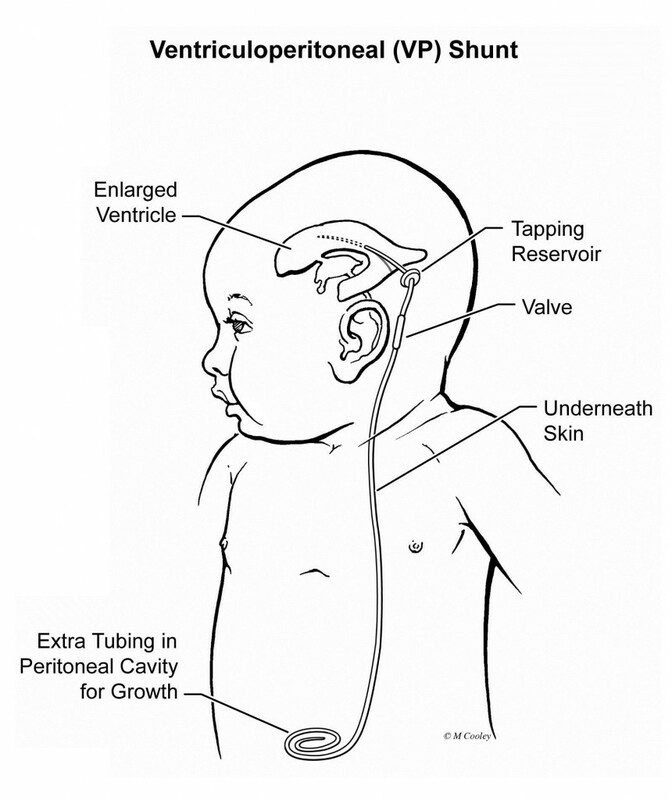 Ventriculo-Peritoneal Shunt (VP Shunt): The neurosurgeon places a mechanical shunting device called a ventriculoperitoneal shunt (VP shunt) in your baby’s head. This shunt helps to drain the extra fluid inside of your baby’s brain and redirects the fluid to another part of your baby’s body such as the abdomen, where it can be absorbed. Endoscopic Third Ventriculostomy (ETV) with Chorid Plexus Cauterization (CPC): An alternative to shunt placement for the treatment of hydrocephalus in some patients is endoscopic third ventriculostomy (ETV). The procedure creates an additional opening that allows CSF flow out of fluid spaces in the brain through an opening made deep in the floor of the brain. This procedure may be used in place of a shunt when hydrocephalus is caused by certain CSF flow blockages. new drain and the CPC slows the amount of water coming from the faucet. After surgery, your baby will receive care in the Children’s Hospital Neonatal Intensive Care Unit (NICU). Your baby may need to be on a breathing machine until he or she is fully recovered from surgery. Your baby will need regular follow-up appointments to measure growth, development and nutrition. You will want to find a local pediatrician to take care of the routine checkups, immunizations, and doctor’s visits. The program coordinator can help if needed. Your child will need to be seen by the pediatric neurosurgeon to check his growth and development and that the shunt or ETV-CPC is working properly.